Also known as black chocolate, dark chocolate is made by adding sugar and fat to cocoa. This type of chocolate contains no milk, or a lot less than in milk chocolate. There is no official definition of dark chocolate in the U.S. It can be eaten as it is, or used when cooking in the form of thicker baking bars which are with high percentages of cocoa ranging from about 70 to 99. Even though dark chocolate has received plenty of positive media coverage for its multiple health benefits, experts urge that before overindulging in this treat, or for doctors to use it in any type of therapy or prescription, more research is needed. Just one ounce or 28.35 grams of dark chocolate contains 9 grams of fat, 5grams of saturated fat, 13 grams of sugar and 156 calories. Saturated fat will raise your blood cholesterol, and this will put you at risk for stroke and heart disease. In chocolate, the added sugar has no nutritional value, and this can cause heart disease and weight gain. It’s a concern that the caffeine in a large quantity of dark chocolate could worsenanxiety disorders. It appears that dark chocolate can raise blood sugar levels, and it could also interfere with blood sugar control for anyone with diabetes. When consumed in larger amounts, the caffeine in dark chocolate can make diarrhea worse. When eaten in large amounts, the caffeine in dark chocolate could also worsen IBS symptoms. 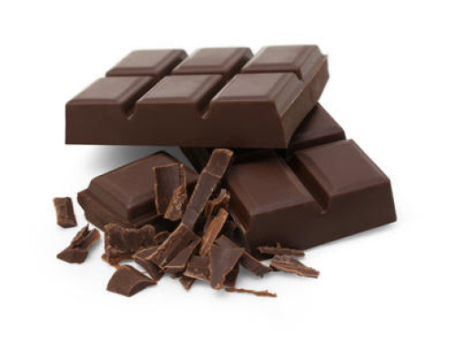 It appears that dark chocolate can keep the valve in the esophagus (the food tube)from working properly, which keeps the contents of the stomach from coming back into the airway or food tube, making GERD worse. Migraines could be triggered in sensitive people who consume dark chocolate. During and after a surgical procedure, dark chocolate could interfere with the control of blood sugar. Do not eat dark chocolate two weeks at least before a scheduled surgery. The cocoa found in dark chocolate orproducts containing dark chocolate can increase the heart rate, or make an irregular heartbeat even worse. Caffeine and related chemicals are found in cocoa. Caffeine-related side effects could be caused, like increased urination, nervousness, fast heartbeat and sleeplessness. Intestinal discomfort, constipation gas, stomach rumbling, nausea and allergic skin reactions can also be caused by caffeine. The additional sugar could send you to your dentist with cavities and tooth decay more often. Lower bone density could be heightened by chocolate. It is a danger to pets as it contains a stimulant known as theobromine which animals cannot digest. During pregnancy and breastfeeding, dark chocolate is possibly safe when eaten in moderate amounts or in small amounts which is found in foods commonly. However, if consumed in larger amounts, dark chocolate could be unsafe because of the caffeine content it has. The caffeine found in dark chocolate crosses the placenta, making concentrations of fetal blood much like the levels of the mother. There is evidence which suggests the high doses of caffeine during pregnancy could be associated with delivery that is premature, miscarriage or low birth weight. It is advised to keep your consumption of caffeine below 200mg each day during pregnancy. Remember that chocolate products give you between 2-35mg of caffeine each serving, and one cup of hot chocolate gives you around 10mg. When you breastfeed, caffeine is also a concern. The caffeine found in breast milk is thought to total approximately half of the caffeine in the blood of the mother. If she consumes too much chocolate, like 16 oz. each day, the infant could show signs of irritability and have too many bowel movements. Look for good quality. Don’t eat chocolates that have partially hydrogenated oils, as these are trans fats and are not healthy ingredients, which could cause higher bad cholesterol levels. Limit dose. Don’t go overboard just because it’s a healthy chocolate. One square a day is generally enough to satisfy your sweet cravings, and studies have proven that the benefits from chocolate are obtained from a small amount each day.